Indianapolis – The Indianapolis Motor Speedway garage area was packed with people on a sun-soaked Friday afternoon, with the biggest crowds massed in front of two sets of garages. At one end of Row 2, dozens of fans strained to get a glimpse of a familiar face in the Team Penske garages, while dozens more did the same in front of the Target Chip Ganassi Racing garages at the other end of the row. These are the two powerhouse teams with five of the top six drivers in Sunday’s 33-car field for the 94th Indianapolis 500. If one of that quintet doesn’t win the race, it will be considered a major upset. But that’s nothing new. 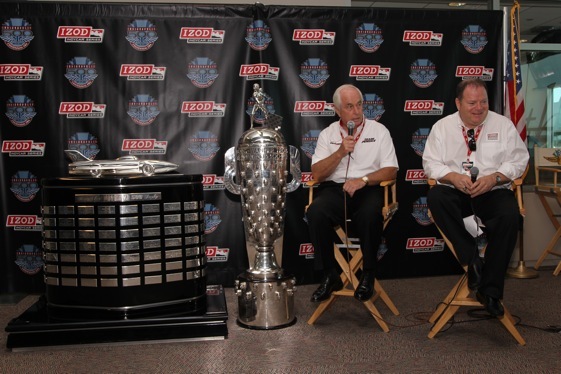 The team headed by Roger Penske has won the big event 15 times in 41 tries, while Ganassi, who raced here before he became a team owner in 1989, has three 500 victories as an owner. Moreover, each of them has a team competing in NASCAR and both have a victory in stock car’s biggest event, the Daytona 500. Penske got his with Ryan Newman at the wheel in 2008, while Jamie McMurray gave Ganassi his first Daytona trophy in February and made him the only other owner to have had winning cars in both of the big races. Penske realized the significance of McMurray’s win before Ganassi did. Over the years, Penske has generally had the edge on relative newcomer Ganassi. But a win here Sunday would give Ganassi something that Penske has never had – victories in both 500s in the same year. Both of them love to win at whatever they do, but it’s also obvious they take special delight in beating each other – and giving each other a hard time. Penske used a bit of gamesmanship last Saturday to assure Castroneves of the pole, keeping him warming up on track near the end of the time trials while Franchitti waited fruitlessly for one last opportunity to take the track for a final pole qualifying effort. A hot Gannassi called it “dirty pool’’ and worse. But Friday, the anger was long gone. “Obviously, the guy sitting next to me is the one that we have to beat every weekend, whether it’s here at Indianapolis or certainly at Daytona or Charlotte,’’ Penske said. On race day, three-time and reigning Indy winner Helio Castroneves will start from the pole for the fourth time, with Penske teammate Will Power alongside and Ganassi driver Dario Franchitti on the outside of the front row. Veteran Alex Tagliani will be sandwiched in the second row by Penske’s Ryan Briscoe and Ganassi’s Scott Dixon. Both Franchitti and Dixon are former Indy winners. That’s exactly the way it worked last year when Dixon and Franchitti led 123 of the 200 laps but wound up sixth and seventh, respectively, after mistakes in the pits cost them a shot at winning. Briscoe and Castroneves led the rest of the laps.